We have two types of IPSEC VPNs: Lan-to-Lan (or site-to-site) encrypted VPN and Remote Access VPN. The first one is extensively used to securely connect distant office networks and the second one for allowing remote users/teleworkers to access resources on a central site network. 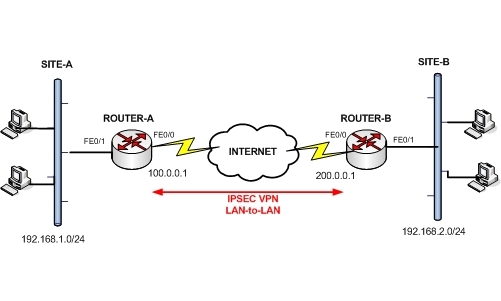 In this post we will describe briefly a Lan-to-Lan IPSEC VPN and provide a full configuration example with two Cisco IOS Routers using IPSEC. Have in mind also that site-to-site IPSEC VPN can also be configured on Cisco ASA firewalls as I have described here. With IPSEC VPNs, businesses can connect together remote office LANs over the Internet with the strong encryption and security offered by the IPSEC protocol. IPSEC is an IETF security standard. It is basically a suit of several protocols that offer secure communication over insecure paths. It is therefore ideal for connecting securely distant LAN networks over the insecure Internet. We could use a private WAN network with Frame Relay or MPLS connections, which however would bring the cost very high. Instead, with IPSEC VPN we can use cheap Internet connectivity (which will be secured by IPSEC) for communication between our remote sites. For IPSEC site-to-site VPN configuration check out the following example. One important point to keep in mind is NAT configuration. In most real networks, the border router which connects the site to the Internet is used also for terminating the IPSEC VPN tunnel. This border router must also perform NAT in order to provide access to the private LAN IP addresses to the Internet. However, IPSEC does not work with NAT. Therefore, we need to create a NAT exemption rule for the traffic going from Site1 to Site2 (and vica-versa) in order to disable NAT for the traffic which is going to pass through the IPSEC tunnel. !— Define Internet Key Exchange (IKE) policy. !— encryption algorithm within an IKE policy. !— Specify that pre-shared key authentication is used. !— Specify the shared secret. !— Define the IPSec transform set. !— IKE to establish the security associations (SA). !— Specify remote IPSec peer. !— are allowed for this crypto map entry. !— should be protected by IPSec. !— Exclude protected traffic from being NAT’ed. !— Access list that defines traffic protected by IPSec. Hey, I was looking around for a while searching for Vpn In Providing Site To Site Security and I happened upon this site and your post regarding Lan IPSEC VPN between two Cisco Routers | CiscoTips, I will definitely this to my Vpn In Providing Site To Site Security bookmarks! I have setup a site-site ipsec tunnel, but is only works if I set my acl_vpn to permit ip any any. If i set to permit ip x.x.x.x 0.0.0.255 x.x.x.x 0.0.0.255 as I should. I get the error “No peer struct to get peer description” and it does not work. You must have identical but mirrored access lists on the two end ipsec routers. If on the first router you have “permit ip 192.168.1.0 0.0.0.255 10.1.1.0 0.0.0.255” then on the second router you must have “permit ip 10.1.1.0 0.0.0.255 192.168.1.0 0.0.0.255”. Make sure also that you reference the correct acl name inside your crypto map. Hi thnx for the response. I have the correct acl in de crypto mapand they are mirrored, but still I get the error “No peer struct to get peer description” And it only works when I set the acl to permit ip any any and it works fine then but it should work with the acl as the example but it doesn’t. Don’t know what I’m missing. Can you please post the part of your configuration related to the ipsec vpn? I need to see it in order to help you. The above is not required. Other than that everything else looks ok. When you say it does not work what do you mean? The tunnel does not come up? The traffic does not pass through the tunnel? How do you test if it works or not? Using just ping? Try to send actual traffic from one subnet to the other and not just pinging. Let me know how it goes. first of all the the static route can be removed that I know but it should not interfer with the config rigth? The tunnel does not come up it stays down. So there is not even a chance to check traffic or ping because the tunnel stays down. It only works for me when I put in permit ip any any. So that is what I can’t figure out.Why it only works with the permit ip any any and not with the rule intended for this acl. Then send over the debug output. Ok Blogadmin thanks very much for the time and support. I figured out what the problem was. When configured as it should with the correct acl for the crypto map, the vpn stayed down until I generated traffic from the source behind the vpn router. In my case the vpn came up without errors when I generated traffic from the 172.16.10.2. So all a long my problem why the vpn stayed down was that there was no traffic. I would like to know if someone already configured a VPN with two links balanced. How can I configure if the interfaces were FastEthernet, because I can´t configure multilink and I´ll have two ip address and I need one ip address to configure the peer of VPN. I have followed this guide as well as several others and setup both my routers according to them but for some reason I cannot see any connection when I do show crypto isakmp sa. I have tried sending traffic from pc’s connected to the lan interfaces but nothing ever comes up. I have the map set on the correct interface and do get the message isakmp is on but neither side shows anything. My friend you have not followed exactly the configuration as shown on my post. You must exclude the vpn traffic from nat. I would like to say I am brand new to Cisco IOS so please forgive my stupidity (past or future). I added the entry on both routers and still have no activity. The command show crypto isakmp sa still shows blank. Ive tried sending ping packets to initiate traffic but no luck. Is there anything else I have to do on the routers themselves? im very new to cisco Can you help me on this i have to configure site to site vpn with 2 cisco router. Router A using ADSL internet connection (Dynamic IP Address, ADSL modem lan port connected to fe0) connected on fe0 in brigemode. Router A Internal Subnet 172.16.1.0/24 Connected on fe1. Router B using Broadband (RJ45) internet connection (Dynamic IP Address) connected on Fe0. Router B Internal Subnet 192.168.1.0/24 connected on fe1 . both router hav nat overload enabled. Although its not officially supported to have ipsec vpn between two dynamic-IP peers, see the following link which might help you. This might have to do with your VPN ACL which is applied in the crypto map. The two VPN ALCs on the two sites must be exactly mirror of each other. Post the config here to take a look. I’m sure your way works well, but after going back and forth all day, i chose a different path and it does not requires a NAT/ACL.. Created a tunnel interface and defined a static route using tunnel0 int. I’ll try your method on my other two routers in my LAB! SO i can get both methods working for my own knowledge..
based on this Cisco doc.